Activist PostDid you know that the U.S. state that produces the most vegetables is going through the worst drought it has ever experienced and that the size of the total U.S. cattle herd is now the smallest that it has been since 1951?Just the other day, a CBS News article boldly declared that “food prices soar as incomes stand still“, but the truth is that this is only just the beginning. 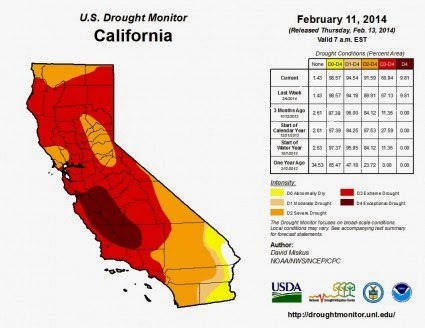 If the drought that has been devastating farmers and ranchers out west continues, we are going to see prices for meat, fruits and vegetables soar into the stratosphere.Already, the federal government has declared portions of 11 states to be “disaster areas”, and California farmers are going to leave half a million acres sitting idle this year because of the extremely dry conditions. Sadly, experts are telling us that things are probably going to get worse before they get better (if they ever do). As you will read about below, one expert recently told National Geographic that throughout history it has been quite common for that region of North America to experience severe droughts that last for decades. In fact, one drought actually lasted for about 200 years. So there is the possibility that the drought that has begun in the state of California may not end during your entire lifetime. There are places in California that if we don’t do something about it, tens of thousands of people could turn on their water faucets and nothing would come out. Experts offer dire warnings. The current drought has already eclipsed previous water crises, like the one in 1977, which a meteorologist friend, translating into language we understand as historians, likened to the “Great Depression” of droughts. Most Californians depend on the Sierra Nevada for their water supply, but the snowpackthere was just 15 percent of normal in early February. #13 Extremely unusual weather patterns are playing havoc with crops all over the planet right now. The list of conspiracy theories over Super Bowl 48 is endless on the internet these days. So what exactly is causing all the fuss? This video walks you through Illuminati symbols and warnings that were given before past False Flag events. There are a lot of oddities to Super Bowl XLVIII, let’s take a look at some. 1. The NFL has a rule that the venue for the Superbowl must either have 50 degree weather in February or be an indoor stadium (domed). In the 47 year history of the Superbowl, only four years has the venue been in cold climes, and all 4 of them where held in domed stadiums. This is the first year since 1972 a Super Bowl has been played in an open air environment with a temp below 50 degrees. The other 43 Superbowls were in places like Miami, New Orleans, etc. thus satisfying the 50 degree rule. + The only stadium whose proposed corporate naming sponsor, Allianz, was fought by the Jewish Anti-Defamation League because the German company had strong ties to the Nazi’s in WWII. MetLife was eventually awarded naming rights but the controversy with the German financial giant Allianz remains intriguing. 3. Forget taxis and limos, Super Bowl ticket holders are being asked to take buses and trains to MetLife Stadium on Sunday. If they don’t, they’ll find parking passes on sale for more than the price of regular season tickets. Hollywoods Warning of a Super Bowl False Flage. More examples of Illuminati warnings from Hollywood. Coincidence? Only time will tell. But if history has any bearing on the future, these warnings should not be taken lightly. So we have a Super Bowl being played in an open air stadium in cold weather below 50 begrees for only the second time ever in the history of the game. 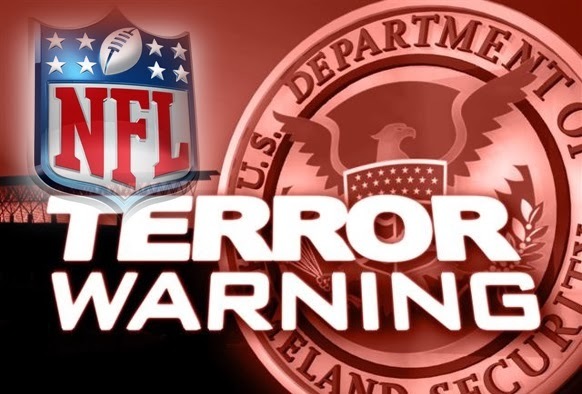 Then we have Israel who is furnishing security for the Super Bowl for the first time ever. Then we have, in their own words, a “Mass transit nightmare” for a sporting event of this magnitude. What could possibly go wrong? UPDATE: According to the National Weather Service, Sunday’s high temperature is expected to be 38 degrees — which would make it the coldest of the 48 Super Bowls. With the opening kickoff scheduled for about 6:30 p.m., the mercury could drop into the 20s by the time the game ends. Spread the word and, hopefuly, we will avoid a tragedy together.